Every time I think I’m getting close to overcoming the brutal learning curve of Rain World, I die. Initially I blamed myself. I decided to spend my first 30 minutes with Videocult’s long-awaited 2D survival game streaming over Facebook. Between my lack of familiarity with the game and Rain World’s aversion to hand-holding of any sort, I wandered beautiful pixel landscapes aimlessly, eating the occasional bat or piece of fruit before being devoured by predators. Surely if I’d been more focused I would have gotten deeper into the game. Now I’m thinking maybe it wasn’t how I was playing, but when. In the days leading up to today’s release, I was alone. Rain World is a game that’ll get easier the more people play and share their experience, narrowing down its obtuse concepts. We’ll come back to that. Rain World is a game I’ve been waiting years to play, ever since I first laid eyes on the pixellated cuteness that is the slugcat. Truth be told, I was more interested in the little critter itself than its plight, navigating a post-apocalyptic world from the bottom of the food chain. I wasn’t prepared for the game’s challenge, but I was invested enough in it to soldier on. So I tried again, this time without the audience. Free from distraction, I would be able to pick up on any visual cues or on-screen messages explaining what I was supposed to be doing beyond eating, sleeping and dying. Only those indicators aren’t there. There is a brief series of tutorials explaining how to eat, jump, pick up and throw objects and hibernate to avoid the deadly rain that regularly fills every nook and cranny of this mysterious world. After that, slugcat is on his own. A little yellow bug creature sometimes points slugcat in the right direction, but its guidance is often cryptic and confusing. Regardless, I played on. I tried to attack the creepy green lizards hunting me in one area by throwing spears and rocks, but the relentless beasts shook off my assault, tearing into my slugcat body with great gnashing teeth. As I respawned at my last hibernation spot, I formulated a plan of attack, only to realize that the creature was no longer there. Death not only rolls back progress in Rain World, it also randomly generates new creature placement, foiling my plans. There are several nightmares here. My next encounter with the lizards (now in red as well as green) resulted in death, so my new plan was to avoid them, which seemed like a very prey-ish thing to do. I clambered up poles, shimmied across perilously jutting beams, leapt gracefully through the air to try and catch a ledge and . . . no, I missed it. Another lizard gets a meal. 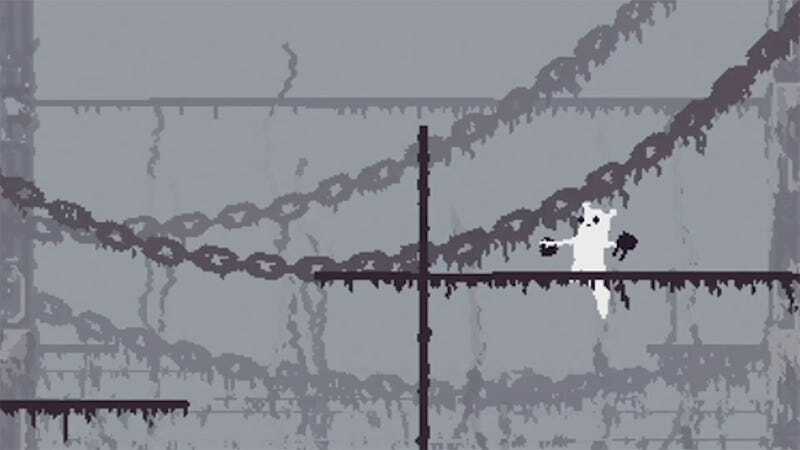 Jumping and climbing are difficult in Rain World. Well, many things are quite difficult in Rain World, but most of them are by design. Perhaps these standard navigation tools are purposefully clumsy, in order to reflect the young slugcat’s nervousness and inexperience. Accident or intention, the controls shovel another heap of frustration on top of a growing pile. Eventually I advanced further along slugcat’s quest for survival, which was pleasant. Each new lovingly-crafted 2D screen is a treat. The appearance of new enemies generated excitement and fear. I discovered a flying insect that would help me jump higher and a plant I could eat that slowed the world (or at least my perception of it). Then a rainstorm came along and snuffed out all of my progress. I had no idea the game could do this. What else could it do? I want to explain an absolutely core part of Rain World right now, because Rain World never explained it to me (and that lack of an explanation cost me so much time I don’t even want to think about it.) When I first started playing, I thought the symbols displayed in the lower left of the window were meant to indicate days or phases because they roll forward each time slugcat hibernates. But they’re not. They represent slugcat’s karma, and should slugcat die they can be lost — rolled back one at a time. This matters because certain areas of the map (and consequently story progress) are gated in ways that require a certain level of karma to access. Wait, what? I had no idea this functionality existed. I, too, thought the symbols were days or phases. Many of my fellow game critics experienced the same frustration with the game as I did. Cheap deaths, lost progress, sloppy controls and little explanation of what was going on—these frustrations were widespread during pre-release play. That said, the experiences these people were having were a bit different from mine. Janine Hawkins figured out the karma thing. Over at Destructoid, Nic Rowen talked about using thrown objects in ways I hadn’t considered. The more people play Rain World, the more they learn and the more they share. That’s something that doesn’t happen in a preview/review environment. Played in relative isolation with no one to share with, the game is not fun. Now that Rain World has gone wide, players can work together to make the experience less frustrating. The lonely slugcat isn’t so alone anymore. It’s too late for me. As much as I’d love to see my slugcat standing atop the conquered corpses of its enemies, I’ve lost hope too many times. I’ve delved deep into caves, only to have a missed jump leave me exposed to the crushing power of the titular precipitation. I’ve uncovered a new area, only to be killed by a well-hidden creature before the joy of discovery could fade. What killed me on this screen?